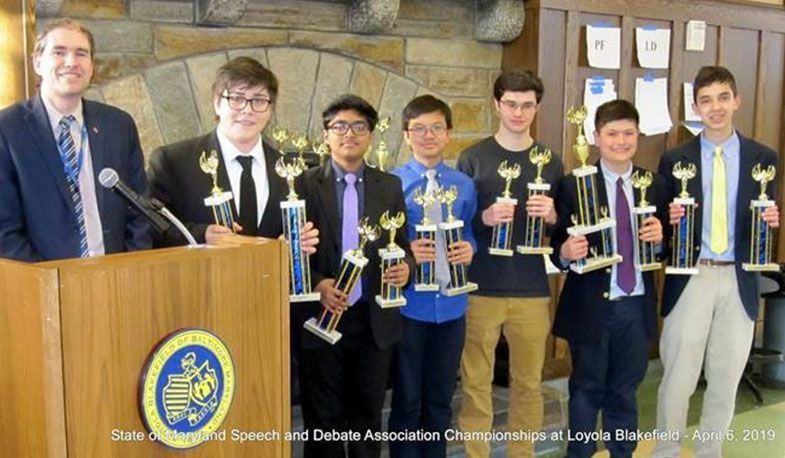 On Saturday, April 6, Loyola Speech & Debate hosted the inaugural State of Maryland Speech and Debate Association (SMDSDA) Championship on campus, which featured 17 schools from all across the state. According to Loyola's program director, Charles Donovan, there are several metropolitan and county leagues spread throughout the region, almost all of which are open only to member schools. A true interleague end-of-season championship that is open to all students and schools in Maryland and DC has not been held in many years. This year, Loyola decided to change that and offered a tournament that had three major goals—bring competitors from across the state to one location, encourage a spirit of fellowship and healthy competition, and provide a forum where deserving candidates could earn suitable recognition. "Thanks to the hospitality of our parents, faculty, team members, and volunteers, the tournament was a great success with our guests reporting a strong overall impression," said Donovan. "We look forward to hosting a bigger and even better State Association tournament in 2020." The team's next stops include the Tournament of Champions at the University of Kentucky and the Spartan Tournament at Southern Lehigh High School, both at the end of April.